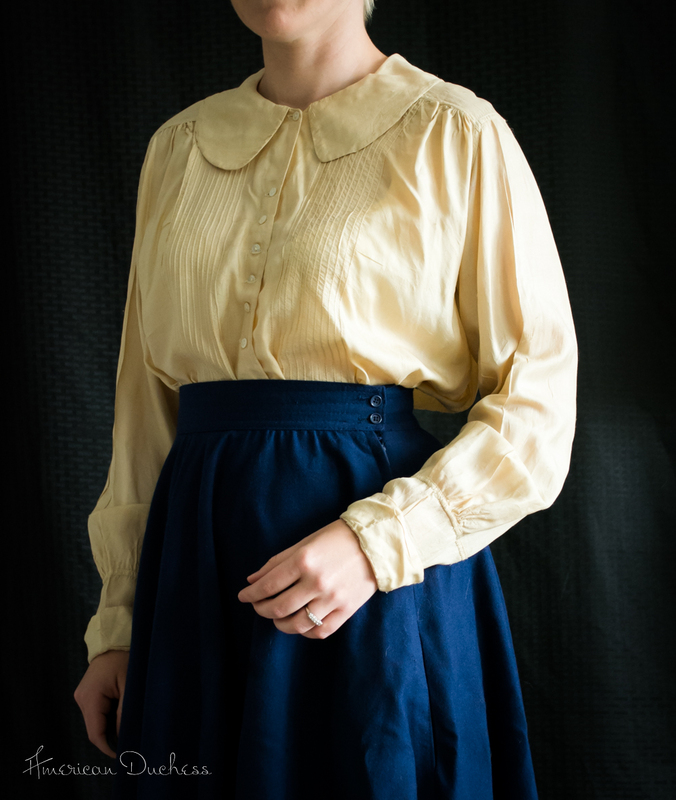 Last month, directly after our annual Titanic Tea, I went a-hunting on eBay and found this lovely blouse. I'm sure with more research I could date this to a more specific year, but until I look at it more closely, I'll put this one in the middle of the 1910s - more specifically, 1915-1917. Edit: Thanks to reader's comments, I went inspecting the interior finishing on this blouse, and have confirmed it is NOT antique, but from the 1970s/1980s instead! I admit I was fooled, but actually I feel a lot better about wearing it now. The style is certainly similar to 19teens blouses (as you'll see below), so I do intend to still wear it with 19teens ensembles. Edit 2: After inspecting this blouse even further, I'm not convinced it is 1970s. The interior seams are overlocked with cotton or linen thread by what I'm confident is hand, but not ALL the seams are overlocked. My guess is that somebody stabilized or repaired this antique blouse at some point after its initial manufacture. Other parts of the blouse, such as the type of fabric and interfacing, bone buttons, cut, and finishing point to it being much older. I haven't had the blouse cleaned or pressed yet. 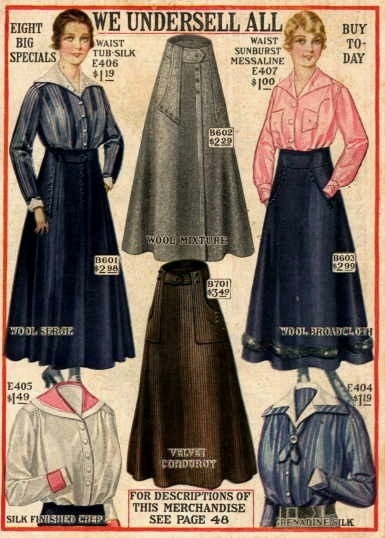 I've paired it here, just for photos, with a blue wool skirt - not period (probably 1950s, but could be much younger), but has lines similar to later 19teens skirts. It's silk, thin but in quite good condition. It's very blousey and is meant to fit loosely, paired with the appropriate skirt. It seems like a versatile style - could be worn with an earlier, slimmer skirt, or a later, fuller skirt. 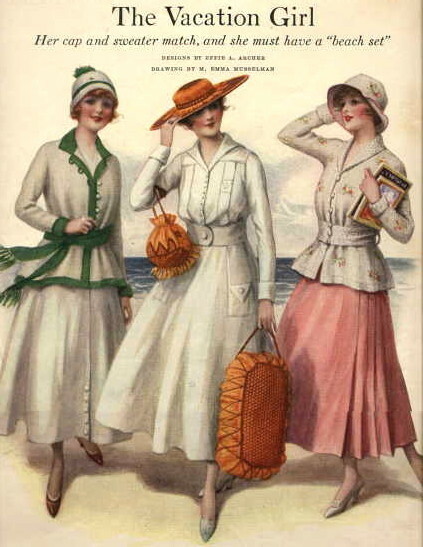 Past Patterns #9056 - Ladies' Waist, c. 1917. Another New Idea Pattern Company, and very similar to the above waist designs, and my antique blouse. I love wearable antique garments (though I know the wearing of such things can be controversial in the community). There's nothing quite like an original - no matter how I try, my modern version are just never the same. They may look the part, but they don't feel the same to wear. I'm greatly looking forward to the next event I can wear this to! Wow, Lauren! Very beautiful on you. I'd say you're right about the mid teens. 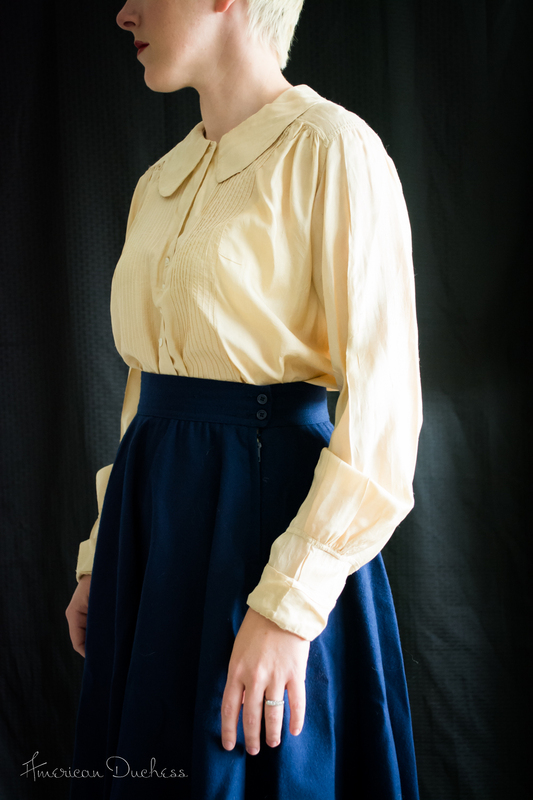 I have an original armistice blouse pattern that has the little waist ties. I think the sloping shoulder is a giveaway also to that era. I need to remember to dig out the pix of my grandmother who was married in 1917 or '18. She made most of her own clothes, too, which is really cool. I'm one of those that are against wearing of original garments. It only destroys them that much quicker leaving even fewer garments for future generations to enjoy. The Victorians wore Elizabethan and Jacobean clothing - which is why there are so few now. What makes me think much later is the thickness of the silk, the high button at the neck with a gap between that button and the next one down (this was pretty common in the 1980's as the high button was there "just in case"), and the way the buttons look. Now, since I don't see the inside of the blouse, it could be from the teens but it might be worth a double check. Oh my gosh! You're RIGHT! I was totally fooled - that'll teach me not to fully inspect the interior of anything - the seams are serged! I feel a lot better about wearing it, now, and I'll still wear it as a 19teens blouse. Thank you! Lol! Not a problem. And totally wear it - it's vintage and has a good few years of wear left. Yes I dd wonder if it is a new romantic repro from the early 80's, there were some simply stonking garments around back then. It is BEAUTIFUL no matter when it was made. Yep, it turns out is IS a repro! And a good one! 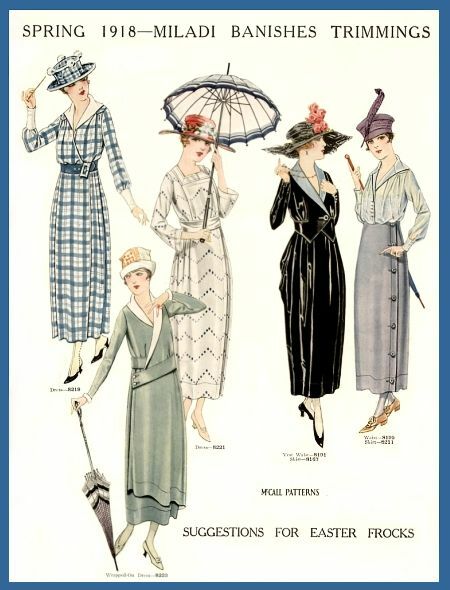 I was so convinced after finding the Past Patterns blouses that were dead ringers, but after reading Isabella's comment above, I inspected the inside and found modern finishes. At least I didn't pay lot for it on eBay! Even if it had been original, we all know you would have taken good care of it. I'm in the wear/not wear camps equally. Delicate or rare garments shouldn't be worn, but occasional, cautious wear for everyday antique garments in good shape can be fun and shouldn't damage the garment too badly if you take the right precautions (not to mention that it is your clothing, so as much as it may bother someone else [and sometimes myself], you can do what you like with your garments since you own them). It weirds me out to think of 80s as "vintage," but 1980s blouses will be rare some day, too! Also, overlock stitching was invented in the 1880s and by the 1890s, catalog-bought clothes sometimes had serged seams, so it might still be antique (three-thread overlock is earlier, four-thread is more modern). Either way, it's perfectly suited for the 'teens! I think antiques should be worn. I wear many of my grandmother's pieces because it would make me sad to keep them in a box somewhere and no one would ever see them that way. I used some of my great-grandmother's lace on my wedding dress, because again, what a waste for it to sit locked up and out of sight. Not everything is going to end up in a museum or classroom setting where future generations will be able to see it, so it should have its last hurrah, I think. Did I miss something? When did your hair get shorter and blonde?